This article is about the type of 3D graph representation. For the 2D floating column diagram showing increases and decreases, see waterfall chart. A waterfall plot is a three-dimensional plot in which multiple curves of data, typically spectra, are displayed simultaneously. Typically the curves are staggered both across the screen and vertically, with 'nearer' curves masking the ones behind. The result is a series of "mountain" shapes that appear to be side by side. The waterfall plot is often used to show how two-dimensional information changes over time or some other variable such as rpm. The term "waterfall plot" is sometimes used as a synonym of "spectrogram" or "Cumulative Spectral Decay" (CSD) plot. results of spectral density estimation, showing the spectrum of the signal at successive intervals of time. delayed response from a loudspeaker or listening room produced by impulse response testing or MLSSA. 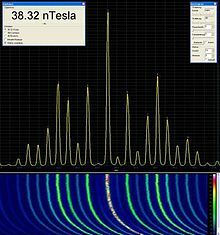 spectra at different engine speeds when testing engines. The upper half of this diagram shows the frequency spectrum of a modern switching power supply which employs spread spectrum. The lower half is a waterfall plot showing the variation of the frequency spectrum over time during the power supply's heating up period. This page was last edited on 16 September 2018, at 08:30 (UTC).